Despite absorbing the loss, Loyola senior Matt Wyatt impressed many pro scouts on hand with his 90+ MPH fastball. Archbishop Spalding coach Joe Palumbo said Loyola kept calling on Monday to find out if their game was still on with the host Cavaliers in Severn. A threat of afternoon showers was on for the metro area and the sun had been replaced by gloomy clouds and drizzle. 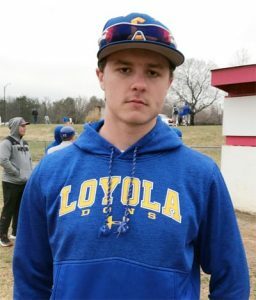 “I knew right then that they were going to pitch Matt Wyatt against us,” said Palumbo of the Loyola ace, who has had a scholarship to the University of Virginia since last season and now in his senior year has a posse of major league baseball scouts on his tail. Wyatt, a 6-foot-4 and 205 pound right-hander who helped the Dons win their first baseball championship since 1946 in his sophomore season, has gone from throwing in the high 80’s as a junior when he won eight games to 90-to-94 mph now and is a big-time pro prospect. 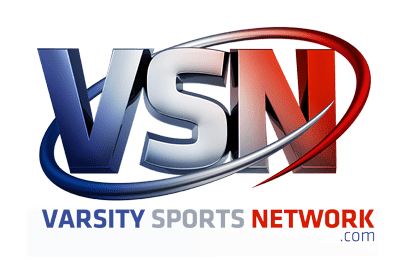 The VSN No. 2 ranked Cavaliers were anxious to get at him on what became a dreary day with a steady, light rain falling throughout, but not bad enough to keep the pro scouts and their array of radar guns away. In what was a site that will be commonplace this spring whenever Wyatt takes the bump, about 10 scouts were on hand, a number that figures to increase as the season goes on. While the radar guns were buzzing through the low 90’s upward to 94, the Spalding bats were smoking even higher as the host Cavaliers rung up four runs on six hits (three doubles) in the first two innings on the way to a 5-3 victory over the 8th- ranked Dons in MIAA A Conference action. The Cavaliers (4-1, 1-0 MIAA A) also sent their ace, US Naval Academy-bound senior Zach Powers (2-0), who has grown two inches since last season, to 6-feet-5, 220 pounds, held the Dons (1-1 overall and MIAA A) to just one run on two hits, while striking out eight through five innings before tiring in the sixth. Reliever Ethan McCormick got Spalding out of a sixth inning jam with a second run charged to Powers and the Cavs took a 5-2 lead into the seventh. East Carolina-bound senior Josh Moylan came on to post a save by striking out the Dons’ No. 3 hitter Nate Beal, with two on, to preserve the 5-3 victory. Loyola had scored an unearned run to start their final at-bat. Spalding had come out smoking with the bats in the first inning against Wyatt, who was buzzing it up there in the 90’s, occasionally hitting 94 on the guns. Moylan, who starts at first base, doubled with one out and DH Cory Blohm drew a walk. After a fielder’s choice, Austen Bishop drilled an opposite field two-bagger to right to make it 2-zip Cavaliers and shortstop Justin Caesar’s knock to center scored Bishop. Wyatt got out of the inning throwing 28 pitches, and 22 pitches followed in the second frame as Spalding made it a 4-1 game on a double by Blohm. Loyola had gotten on the board on a leadoff dinger to right-field by Danny Sheeler in the top of the second. Wyatt threw a scoreless third and left after throwing 70 pitches, striking out five, walking three and giving up the six hits and four runs. Mike Jensen and lefty Josh Feeheley finished up on the mound for Loyola and kept the Dons in the game. 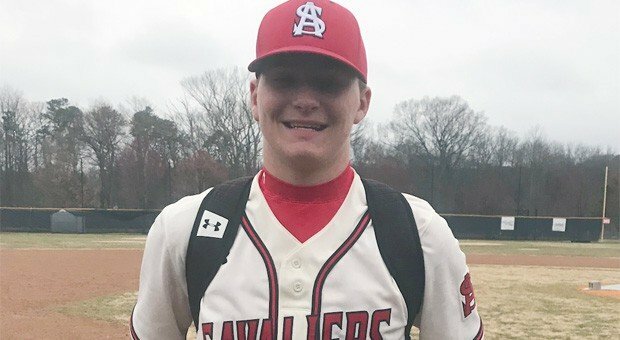 Spalding got its fifth and final run on a two-out homer in the bottom of the fifth by Ben Wieman and it proved to be a huge insurance run after it scored its third run in the final inning. Pictured above: Matched up against Loyola ace Matt Wyatt, Spalding’s Zach Powers pitched into the sixth inning, limiting Loyola to just one run on five hits, with eight strikeouts, over the first five innings, and earned his second win of the year. Matt Wyatt, Mike Jensen (4), Josh Feeheley and Emmett Reynolds; Zach Powers, Ethan McCormick (6), Josh Moylan (7) and Tyler Hargus. 2B: AS-Moylan, Austen (CQ) Bishop, Cory Blohm and Hargus. HR: LOY-Danny Sheeler; AS-Ben Wieman.